First published in 1929, this book was intended to explain, "with documentary evidence", the main principles and ideas for which Gandhi had stood over the course of his career up until that point. The author draws upon his long and intimate personal relationship with Gandhi to give an authoritative and individual account of a man whose politics and philosophy has invited continuing analysis — extended with illustrative selections from his speeches and writings. 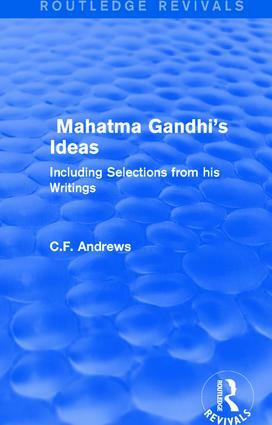 The context in which Gandhi’s ideas were formed and developed provides the focus for this book with the first part examining the religious environment and the second the historical setting.